There’s still a month until the 2016 Ironman World Championship in Kona, but the 2017 qualification season has already begun. Last weekend Ironman Vichy awarded the first 40 Kona slots for next year’s Championship race. That means it’s time for me to review previous results and slot allocations and compile the numbers for 2017 Kona Qualification. If you want to qualify you’ll need to train hard and achieve exceptional fitness. Nothing here will change that. In the files below you’ll find estimates for slots across age groups and summaries of previous finishing splits for those slots. They’re a rough guide to the kind of performances required at a given race. It’s up to you to reach the level of fitness required to hit those times. If you have trained well, then they may help you make a more effective choice of qualifier. Combined with knowledge of the course you can look to pick a race that favours your strengths and perhaps gives better odds of placing in a qualifying position. There are, of course, no guarantees. 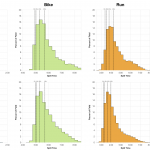 Let’s start with some summary data: the current allocation of Kona slots to individual races. This information is taken from the Ironman.com website. The standard in 2017 is for a regional championship, like Frankfurt, to receive 75 slots in total and for other races to receive 40 slots. There are one or two variations on this, it’s not unknown for a new race to receive 50 slots or a smaller event to carry only 30. Some 70.3s also carry slots – the World Championship for one, but two new Chinese 70.3 races add 100 slots to the 2017 total. As it currently stands, even with those 70.3 slots, there are fewer known slots on offer for 2017. This may well point to new races that have yet to be announced. As a final note on this slot allocation. Some of these numbers may change. We’ve seen races cancelled and slots transferred to other events or bonus slots added to an event on its anniversary. With Ironman few numbers are set in stone. The summary reports below give qualification targets by highlighting the typical time requirements in each age group and at every qualifying event. Estimated Kona Slot Allocation for 2017 Qualifiers lists my estimated slot allocations for each age group at each race currently in the 2017 qualification season. These estimates are based on previous age group numbers and assumes the 2017 qualifier will follow a similar distribution. Average Age Group Winning Time lists the average times (from previous years of racing) for the winners in each age group at a given race. Alongside this is the average overall winner’s time for the appropriate gender. Average Age Group Winning Time as Percentage of Race Winning Time lists the above average age group winning times as a percentage of the average overall winner’s time for the appropriate gender. Average Qualifying Time for 2017 Kona Slot Allocation lists the average times for all potential Kona qualifiers, based on estimated slot allocations, in each age group at a given race. Average Qualifying Time as Percentage of Race Winning Time for 2017 Kona Slot Allocations as before lists the above average age group Kona qualifying times as a percentage of the average overall winner’s time. 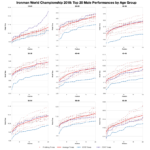 Average Final Qualifying Time for 2017 Kona Slot Allocation lists the average times for the previous final Kona qualifiers in each age group at a given race. Average Final Qualifying Time as Percentage of Race Winning Time for 2017 Kona Slot Allocation again lists the above average age group final Kona qualifying times as percentages of the average overall winner’s time. 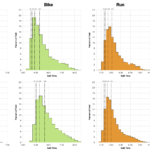 Average Qualifying Range for 2017 Kona Slot Allocation lists the difference between the average times for age group winners and the last Kona qualifier at a given race. From these tables you can pick up some information on how fast a race is, how fast qualification is and how tight qualification can be. Slot allocations are estimated using previous race numbers (except for Vichy as race numbers are known) and will vary on the day. In the case of Ironman Weymouth the slot allocation is currently incorrect and will be fixed when I update my Kona Qualification page. Weymouth will group all over 50 athletes into one age division for the purposes of allocation. While I fix my code an allocation can be found on the main Kona qualification page. Averages only reveal so much. The more detailed reports below dig deeper including listings of past results and break downs of Kona qualifying splits at every race. The chart at the front of each document attempts to summarise the two sets of tables that follow. As the image above shows there are 4 key pieces of information in each chart. First the number of slots in that age group for a given race. Next the average race winning time (not gender determined this time – my oversight). Then the distribution of Kona qualifying times seen at the race, indicating what times are most common. Finally, if the 2017 qualifier has already been raced, the times for automatic qualifiers at that most recent race. The races are listed in order of average winning time. The Past Qualifying Times section contains tables of past results for each of the 2017 Ironman qualifiers. Each table lists the winning time (of the appropriate gender), the age group winning time and, if there was more than 1 slot, the time for the last Kona qualifier that year. Remember that last Kona qualifier times are based on the 2017 slot allocation – if 6 slots are allocated for an age group in 2017 then I will look at 6th place times for all previous races for fair comparison. The tables are summarised with the average times for the three placings. 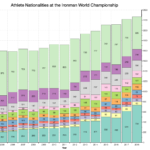 The Average Top 10 and Kona Qualifying Splits section looks at average splits for the top 10 race positions and all Kona qualifying positions at each qualifying races. Each tables lists the average swim, bike, run and overall splits for the race winner (again gender appropriate) and at least the top 10 places in that age group. To summarise, averages are given over the whole of the top 10 and all the qualifiers at the race. This mass of information gives some idea how the summary data is produced, both the history of results behind it and how they breakdown into individual splits. This might indicate if a race has become a faster qualifier or if its swim, bike or run courses are particularly tough. Having provided all this information on qualification times I will finish by noting that ultimately there’s not that much to choose between qualifiers. Some are certainly harder than others, but in every case the fitness and focus required is high. There are no easy options here.